I am a big Audrey Hepburn fan and was instantly drawn to the name of this product – Holly Golightly was the character Audrey played in one of my favourite films – Breakfast At Tiffany’s. 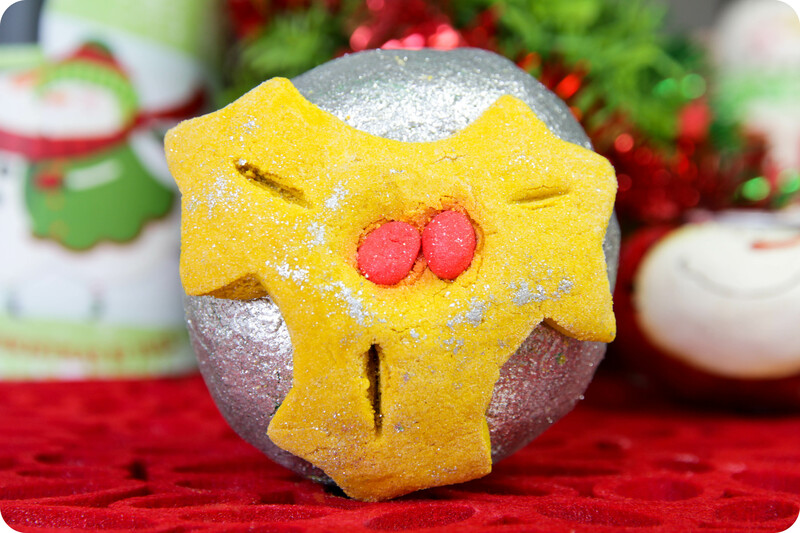 The perfect Christmassy design, Holly Golightly Bubble Bar is adorned with beautiful silver sparkles and a pretty piece of Christmas Holly to top it off. I’m not exactly sure why the Holly leaves are yellow (the website shows they should be green) but I’ll just take it as a special adaptation for us South Africans… *shrugs* This Bubble Bar shares it’s scent with Hot Toddy Shower Gel (you can read my review here), so it has that spicy mulled wine scent, mixed with a fruity twist that reminds me of old-fashioned Coca Cola. Holly Golightly contains Cinnamon Leaf oil (definitely a top note), uplifting Persian Lime oil, earthy Patchouli oil, warming Clove Leaf oil, refreshing Sweet Orange oil, as well as Benzoin Resinoid (this is used by Aroma Therapists for treating depression, nervous exhaustion and stress-related conditions because the scent is so uplifting). It really smells good enough to eat, but I managed to keep myself from taking a bite out of it. This Bubble Bar is definitely designed to warm you up on a cold, rainy evening, moisturise the skin and leave you smelling like a giant Cola lollipop (trust me, it’s a good thing!). It fills the bath tub with an impressive amount of soft, silky bubbles and fills the bathroom with the aroma of a cozy Christmas eve. Even though we celebrate Christmas during Summer here in the southern hemisphere, I still like to drink chilled Egg Nog or warm mulled wine on Christmas eve. I did a blog post on my ‘Chilld Eggnog’ (it’s delicious by the way) around this time last year, you can check out this blog post for the recipe. From the outside it looks like a silver Christmas pud but when you begin to crumble it under the running tap, you’ll notice the inside is a vibrant Christmassy green shade. This turns the bath water into a vivid shade of green with sparkly silver lustres floating around. Don’t worry, though, I wasn’t covered in sparkles after resentfully climbing out of the bath (a few stubborn ones did stick to my skin but they were quickly removed once I started drying myself with a bath towel), and the left-over lustres rinsed out of my tub quite easily too. The generous size of Holly Golightly Bubble Bar means you’ll get 3 bubble-icious baths out of this single Bubble Bar, making it great value for money. I always use a sharp knife to cut these Bubble Bar babies up, it’s way less messy and you’re guaranteed to get even-sized pieces. Top Tip: Wrap your LUSH Bath Bombs, Bubble Bars and Bath Melts in cling wrap as soon as you get home, especially if you know you won’t be using all of them in the next week or two. This just means they’ll last longer – the scent will stay intense, and they won’t dry out (making them less effective). Holly Golightly Bubble Bar retails for R 82,50 and is currently available in the LUSH online store, as well as in-store (Cavendish, V&A Waterfront, Canal Walk and Gateway). I haven’t watched breakfast at tiffany’s. …so sounds like a stripper name to me. lol. I love the silver…think it makes it look expensive 🙂 making it hard for me to decide what I am going to be ordering once you have finished your reviews. Oooh all that silvery goodness.. Loved Breakfast at Tiffany’s, I’m also a fan of Audrey Hepburn. What a great tip to store in cling wrap!